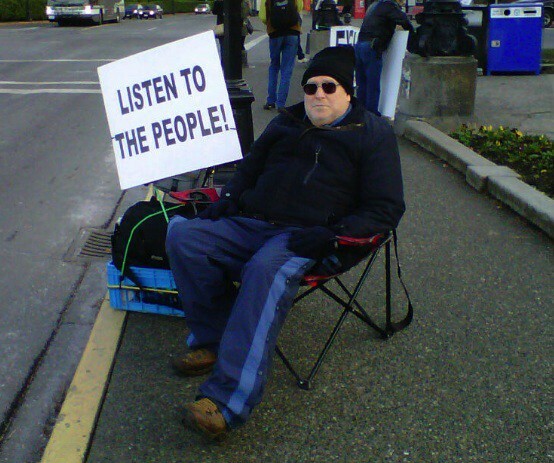 A picture I took of a protestor (with his permission) who set up camp outside the B.C. legislature week after week to protest tax changes. It used to be that when we brought people together to talk about tough issues we had the idea we’d done it well if people were happy, agreed and thought our processes were good. Those days are long gone. It used to be that we applied all our skills and knowledge to resolve conflict, eliminate outrage and earn people’s trust. Those are honourable but unrealistic goals. It used to be that we thought conflict resolution could resolve conflict, interest based negotiation could result in durable solutions and that we could create processes with a goal of people agreeing to a way forward. The days when conflict resolution was effective are gone. We live in a different time, where we need to redefine the new normal. We need to stop creating processes where failure is defined as the presence of conflict or outrage and instead define success as the presence of emotion, concern, outrage and conflict and our ability to really hold the space for those brave, honest conversations that need to happen. We need to recognize conflict, outrage and opposition will be present, welcome it in, and create conversations where we build capacity to talk together about tough issues and build alignment rather than agreement. A new definition of success is working WITH the conflict, outrage and opposition people bring to a tough conversation and creating spaces where everyone recognizes we have some tough decisions to make together. Where we design processes that take everyone on the journey in recognizing there is more to conversations in our communities than just our own needs. I gave a speech last week in Vancouver where I was asked “What is the future of public engagement? What do you think needs to change or adapt in the field?” It’s a BIG question, not easily answered, but here was my attempt at a response. It’s time we recognized outrage and opposition are here to stay. Social norms and expectations are vastly different today than they were five years ago, and people go right to protesting and saying no when a project is proposed that doesn’t align with their values or meet their needs. I have no problem with that; its the basis of democracy. However, it creates an environment where people tell you what they DON’T want, rather than what they DO want. Let’s bring in the concerns AND talk about solutions too. Let’s also start recognizing we don’t live alone in our communities and there are others who might think differently, and we need to consider those views too. It’s time we stopped having all our conversations about tough issues on a project by project basis. Instead, let’s talk about the real values driving opposition and reaction to projects. Let me give you an example: imagine if we had a national conversation about the environment and the economy instead of a series of separate conversations about pipeline after pipeline. Imagine a conversation where indigenous communities, oil companies, environmentalists, government and regular Canadians came together to talk about HOW we really create a viable economy that leverages our natural resources, respects and recognizes indigenous rights and territory and protects and stewards the environment? Just imagine that conversation! I can envision that conversation would result in multiple solutions that met all those needs and included options like renewable energy sources, economic development possibilities and benefits for indigenous communities. Instead, we have these deeply polarized conversations one pipeline at a time, and people chain themselves to fences, threaten to wreak havoc on the economy or suggest legal action. How is that a way forward? We need to drop the “public” in public engagement, and recognize we need to focus on how we create a way of talking together through brave, honest conversations every day — in our lives, organizations and communities. Some organizations do a great job talking to the public or stakeholders and have a dysfunctional internal culture where meaningful conversations are hard to have. Other organizations do the opposite. In the end we won’t find viable solutions unless we keep having hard conversations whenever and wherever they are needed, so we can move forward together. We need to build real leadership for brave, honest conversations on really tough issues. We’ve solved all the easy challenges in our communities and we’re left with the really tough ones. Think climate change, poverty, intensification, reconciliation, environmental damage and more. We need leaders willing to take a stand for the CONVERSATION, without knowing the answers, solutions or outcomes that might result. It’s time we changed the paradigm from indivdiual right to have a say, to reocgnize people have a right AND a responsibility to their neighbour. It’s time we all advocated for the collective good and stopped putting bandaid solutions on tough problems. I totally respect each person’s right to their view, perspective and need. I’m also tired of people who can’t see beyond their own needs. It’s time we understood we live in communities together, and it will take all of us to find our way forward. Tell me what you don’t want and then also tell me what you DO want. Then tell me how those wants also meets the needs of your fellow neighbours. Bring your “no” to the conversation, and also your solution to the situation. Let’s ask more of each other, dig deeper, and try harder to really solve the challenges facing us. Let’s agree that vitriol, public shaming, marginalization and hate is just not a go. Let’s call it out as unequivocally not all right and be clear it is the behaviour we won’t tolerate, not the people who are upset we take issue with. An enormous number of people — including politicians — are removing themselves from social media because of the total disrespect that is generated in online conversations. It’s time we all stood up with brave hearts and said that it isn’t OK. Lets take the inform and consult levels off the IAP2 spectrum once and for all. In 2015 I wrote a blog re-imagining this core tool of the engagement practice, and called for the removal of inform, and offered suggestions about removing consult as well — because they aren’t real, meaningful engagement. Let’s agree that in a world of outrage, opposition and polarization we need to meet people where they are at, and have real conversations in meaningful ways about the things that matter most. It’s time the tools of our practice reflected the world we live in. Stand for something, and act like a courageous leader. This work is not for the faint of heart. Engagement in this environment is risky business. Let’s take a stand for courage, compassion and integrity and step forward and invite people into these conversations, ask more of them and create spaces where we talk together about tough stuff. Let’s recognize there are no easy solutions or magic wands to make things perfect, and recognize the hard work we are doing of building communities and creating capacity for brave, honest conversations. Let’s stand for that, and believe in our ability to really have these conversations together.